You've got a limited daily budget; we've got bargains for your consideration. As always, we urge you to view the weather reports and double-check lineups before finalizing your selections. We've got rain in the Midwest, gamers. Beware. Andre Ethier, OF, at Mil (Garza), $2800 at FanDuel: Ethier, in case you hadn't noticed, is in a bit of a groove at the moment. He's 10-for-30 with two doubles and three homers over his last eight games, and injuries have created a path to playing time. No way you're worried about Matt Garza, right? Heck no. Garza enters Tuesday's start with brutal pitching ratios: 1.57 WHIP, 4.60 ERA, 1.46 K/BB. Ethier's career slash against RHPs is .304/.383/.507. Howie Kendrick, 2B, at Mil (Garza), $3100: It's a tiny sample, sure, but Kendrick has absolutely mauled Garza to this point in his career (7-for-12, double, homer). Garza has yielded five home runs over his last 18.2 innings, and the Ks have been few and far between (5.8 K/9). Nick Hundley, C, vs. Ari (Collmenter), $3400: First of all, Hundley gets a Coors bump — it's nice to have a share or two of the Colorado action. Secondly, Hundley is on a nine-game hitting streak, going 13-for-32 with four extra-base hits. And lastly, he's facing a pitcher against whom he typically feasts (6-for-14, double, homer, 2 BBs). I'm in. Scott Feldman, P, vs. Tex (Rodriguez), $6900 : Here's a reasonable bargain play, if you're looking to buy a few of Tuesday's pricier hitters (such as Goldschmidt for $6100 at Coors, for example). Obviously Feldman can get lit up by any opponent at any time, but it's tough not to like him here, facing Wandy Rodriguez and the nine-win Rangers. I'm giving him a good shot at 7.0 innings and a win. Houston is a heavy favorite on Tuesday, for obvious reasons. Andrew Cashner, P, at SF (Vogelsong), $8700: For those who'd like to buy a near-ace at a reasonable price, Cashner is the play. (I'm starting Strasburg more than any other starter on Tuesday, but he's not exactly a bargain.) 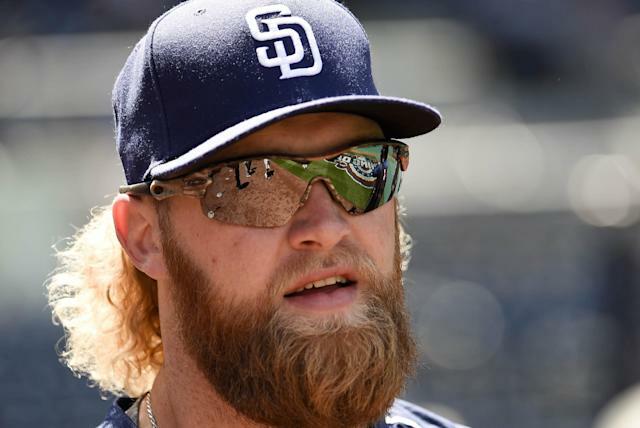 Cashner hasn't allowed more than two earned runs in any of his last four starts, and he's coming off a 10-K outing versus Houston. He's been unlucky in terms of wins and losses (1-4), but run support shouldn't be an issue on Tuesday, not with Ryan Vogelsong on the hill for San Francisco (2.02 WHIP, 8 HR allowed). Yonder Alonso, 1B, at SF (Vogelsong), $2600: Everyone is hitting Vogelsong this year, but LHBs have really crushed him: 13-for-33, 7 HR(! ), .394/.474/1.091. Assuming Alonso is good to go after Monday's DNP (back), he's a strong matchup play with a dirt-cheap price-tag. Wilson Ramos, C, vs. Mia (Latos), $2800: Latos opened his season with a disastrous start (0.2 IP, 7 ER), and he's been merely tolerable in recent appearances. His velocity is down a few ticks from his best years. Ramos has a homer, single and a pair of walks against Latos in nine career plate appearances. He also enters the day with a nine-game hitting streak, batting .298 on the season. Billy Burns, OF, at Min (May), $2300: Burns has been leading off for Oakland in recent days, going 5-for-14 since being recalled on Saturday. You might recall that Burns was a spring monster for the A's, and he's carried that level of performance in the regular season, slashing .315/.378/.404 at Triple-A. The kid is blazing fast — he stole 74 bags in the minors in 2013 — so he can pile up points in various ways. Lucas Duda, OF, vs. Bal (Norris), $2700: Bud Norris was horrendous in two of his four starts this season, and he was meh in the others. With Bud on the bump, I'll happily roster a left-handed slugger with on-base skills. Jhonny Peralta, SS, vs. CHC (Hendricks), $2500: This just feels like a weird price for a shortstop who bats in the clean-up spot for a damn good team. Peralta is slashing .305/.358/.432, so it's not as if he's struggling. He's also 3-for-8 against Hendricks, for what it's worth. I'm all-in with Peralta on Tuesday.